The Gospel of John plays a large role in the church’s understanding of the Trinity, but symptomatic of the increasing specialisation within scholarship is an unfortunate separation of exegesis from systematic theology. We are left with Biblical studies neglecting to take the next step from study of the Biblical text to further theological reflection and synthesis. Köstenberger and Swan’s hope to set an example of how the two can be rejoined in their work Father, Son and Spirit by providing a study that, “summarises and synthesises what John has to say about God as Father, Son and Holy Spirit” (p20). Being a work of biblical theology, the authors seek to place their study in its historical context and draw primarily from the literary flow and content of John itself. To achieve the former, they draw upon scholars like Baukham and Hurtado, who have provided excellent studies on early Christianity in historical context, to place John’s Gospel in the setting of Second Temple Judaism. 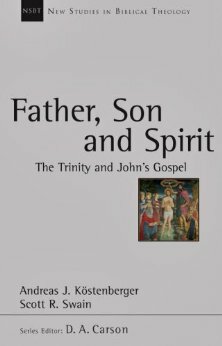 As to the latter, the authors devote five chapters to exegeting what John has to say about the words ‘God’ (Theos), ‘Father’, ‘Son’ and ‘Spirit’ respectively. These chapters follow the narrative of John’s Gospel, commenting on each relevant occurrence in its content. In effect, these chapters put out all the information on the table, to be synthesised later. Variations of the the words are also examined, as in the chapter on the Son which includes discussion on different Christological titles such as ‘one-of-a-kind son’ (monogones, eg. John 3:16), ‘Son of God’, ‘Son of Man’, and ‘The Son’. These chapters conclude that John’s Gospel portrays Father, Son and Spirit as united and equal in possessing divinity but reflecting differing relationships (105). For example, the Son is sent by the Father and the Spirit sent by both Father and Son. This reveals a unity but also distinguishing marks between each, setting the stage for later doctrinal expression of the Trinity. The remaining four chapters pull some of these pieces together and draw out theological implications for our understanding of Christ’s ‘filial identity’ in relationship with the Father, the person and role of the Spirit in Christ and believers, the trinitarian mission theology found in John, and a conclusion on John’s representation of the Trinity. These chapters are not purely systematic in their presentation, they still remain tied to the Biblical text of John. There is much to be found in these chapters. Father, Son and Spirit is then rounded off with a bibliography and indices of authors, Scripture and other ancient sources used. The nature of this study is highly textual. The authors don’t want to leave the Biblical texts to make their conclusions until they have mined them thoroughly and sufficiently. This is admirable. Our theology must originate from careful Biblical exegesis, and too often we are confronted with theology divorced from the Biblical texts or theology ‘supported’ by proof-texts. Not so here. “John’s claim that Jesus is ‘Christ’ and ‘Son of God’ amounts to more than asserting that Jesus is Israel’s rightful king” (p41). The authors see the claim as one of deity. They support this by showing that Jesus is accused of blasphemy for claiming to be the ‘Son of God’. While this is the case, it’s never exactly explained in detail why these titles result in the charge of blasphemy. Instead of unpacking this more, a work by Hurtado is referenced in the footnotes as support. In some contexts ‘Son of God’ can mean kingship but in other contexts means more and actually requires us to see it as a divine title, so more here would have been helpful. Carson’s Jesus the Son of God (review) is helpful here. Salvation in Christ is, “in keeping with Isaiah’s vision of a new exodus for God’s people” (p37). This idea of new exodus unfortunately isn’t expanded nor are there any supporting Scripture references provided. Thomas calling Jesus ‘God’ in John 20:28 is referred to 9 times according to the Scripture index, but in none of these references is the traditional understanding actually defended. Since the scholars dispute other claims of liberal scholarship, it is unfortunate they didn’t do so here since Thomas’ actual meaning is important for supporting their conclusions. Jesus’ “I am” statements are “clear allusions” to God in OT, and thus a claim of deity (p125). While I agree, there is no space in this work given to defend this claim against detractors, only a footnote referencing a work of Baukham as support. In fact, of the 7 footnotes on this page, 5 refer to Baukham. In sum, at times this work is a bit vague in what seems to be some of the more important areas of their study. This is quite odd, but I must emphasise that the majority of the time this is not an issue in Father, Son and Spirit but that makes these exceptions all the more unusual. Moving back to the positives, Köstenberger and Swain have produced a fair and balanced work. Köstenberger is an expert on John and his familiarity with the source shows in his thoroughness. This book is densely filled with information. The attention to detail and collection of data is impressive and a good example of careful evangelical scholarship. The authors are also not content with mere head knowledge, they want to serve the church. Even in the introduction, they list a reliance upon the Spirit (p23) as part of their interpretive methodology. It is refreshing that they do not try to claim neutrality to gain respect by the academy. Perhaps the best chapter is on the trinitarian mission theology in John. This chapter on the theme of going and sending and its relationship to the Trinity was particularly illuminating and highly recommended. I won’t spoil it in this review, you’ll have to pick it up yourself. Köstenberger has a commentary on John and a work on John’s theology, but Father, Son and Spirit stillhas a place. For a concise work on Trinitarian studies in John from a Biblical theological approach, this is a highly recommended work. This also is a fantastic book to see the how the doctrine of the Trinity is tethered to Biblical studies. Father, Son and Spirit would serve any interested student or teacher, or even be helpful in a class environment. Father, Son and Spirit is a natural addition to the already excellent New Studies in Biblical Theology series.